On Thursday Felipe VI visited for the first time the European Palace of Strasbourg, seat of the Council of Europe, since he was crowned monarch. To celebrate the visit, as is customary in all heads of state, the king has presented the Secretary General of the Council, Thorbjorn Jagland, with a triptych with photographs on the Camino de Santiago, a ceremony attended by the Minister of Foreign Affairs, Alfonso Dastis. These are three black and white snapshots of the Spanish author Juan Millás who capture several key moments of the pilgrimage to Santiago and the legacy of the Jacobean routes as a link between Europe and the Iberian Peninsula. In the words of Dastis: "a tribute to what in all cultures has knowledge of the trip." The monarch has valued the Camino de Santiago as a key element to "understand our past and our essence", in addition to stating that it "inspires us to continue our efforts to continue building a more just, tolerant and supportive Europe." 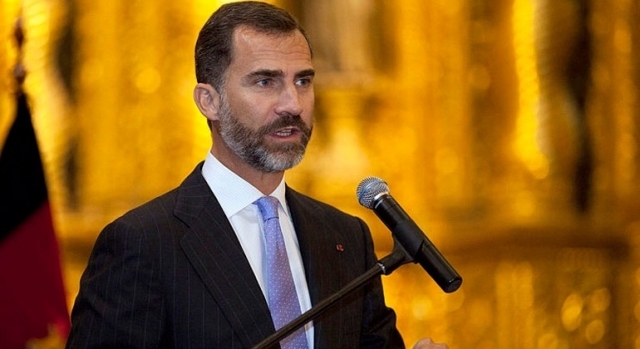 Felipe VI has highlighted the Jacobean Route which remains "one of the main symbols of unity on the continent, a fundamental part of shared memory and European identity." The Camino de Santiago was declared by the Council of Europe as the first European Cultural Itinerary on October 23, 1987 at an event held in Santiago de Compostela. King Felipe VI, for his part, was named the first honorary ambassador of the Camino de Santiago on November 6, 2015 at the Pazo de Raxoi, in the city of Compostela.